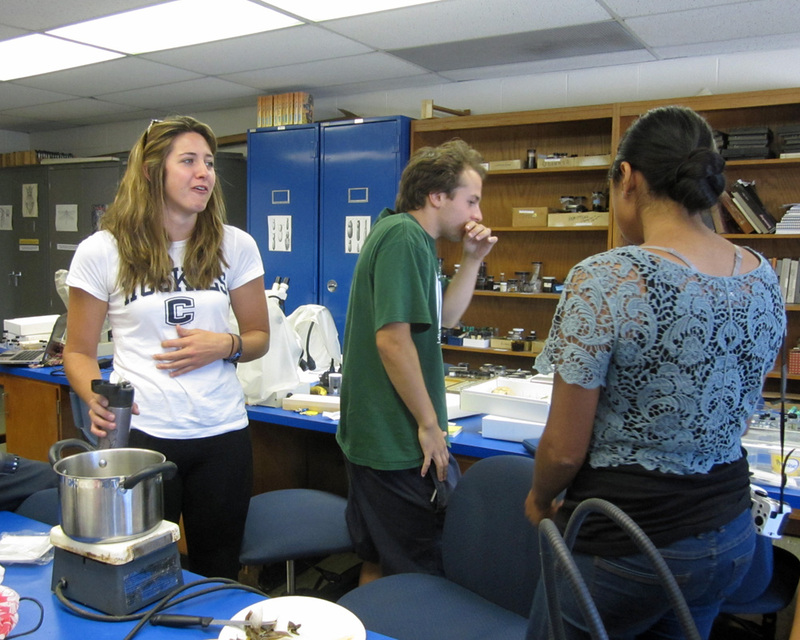 This is the last week of field entomology – I can’t believe how fast it has gone by! You can check out my curriculum at the course website (though the materials are password protected). Just about everything was done from scratch. I used some handouts used in previous entomology classes to help me organize my lectures, but otherwise I’ve been on my own. Writing lectures, organizing field trips, driving the field trip van, gathering supplies, creating assignments and quizzes, grading, answering questions, and staying in the lab many hours past class time. I even took the students on a night collecting trip outside of class, which was a blast. These are all reasons why my blog has been ignored – I was warned by the grad student who taught it last year that it would take over my life, and it has. Then I have a week off, then general entomology starts! (I’ll be the TA). 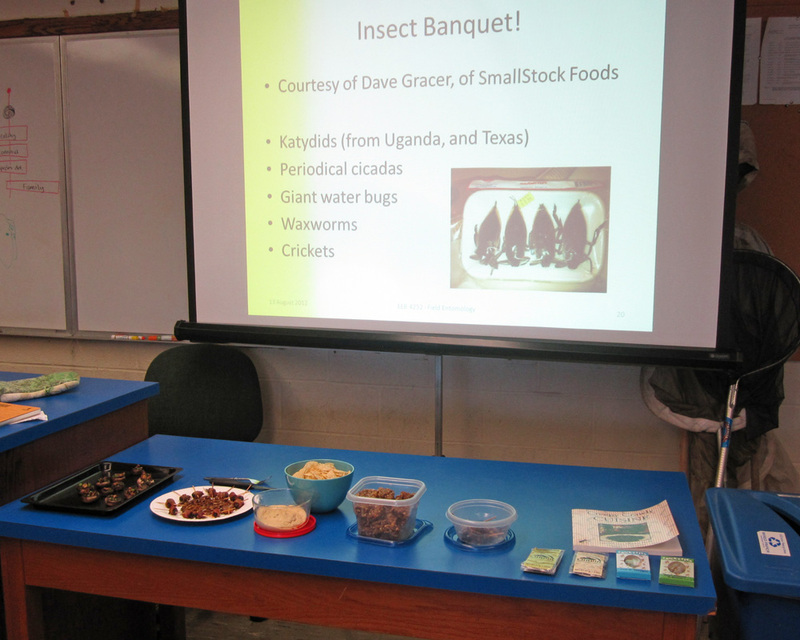 Today I decided to have an insect banquet, to start the last week out with a bang (it ends with the final exam on Friday, when their collections are also due). Some insects I purchased alive from a pet store, and some I purchased from Dave Gracer of SmallStock Foods. 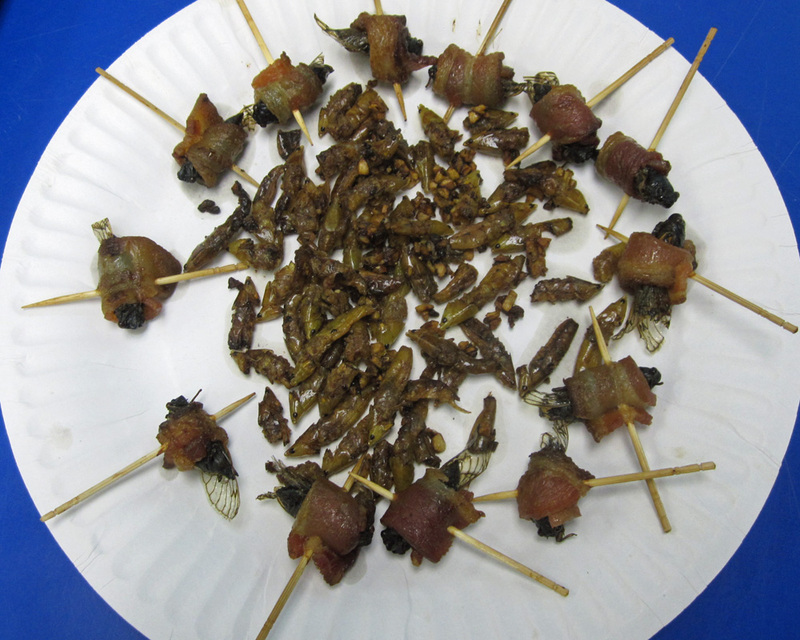 He was able to provide me with a great assortment of insects with very different flavors. 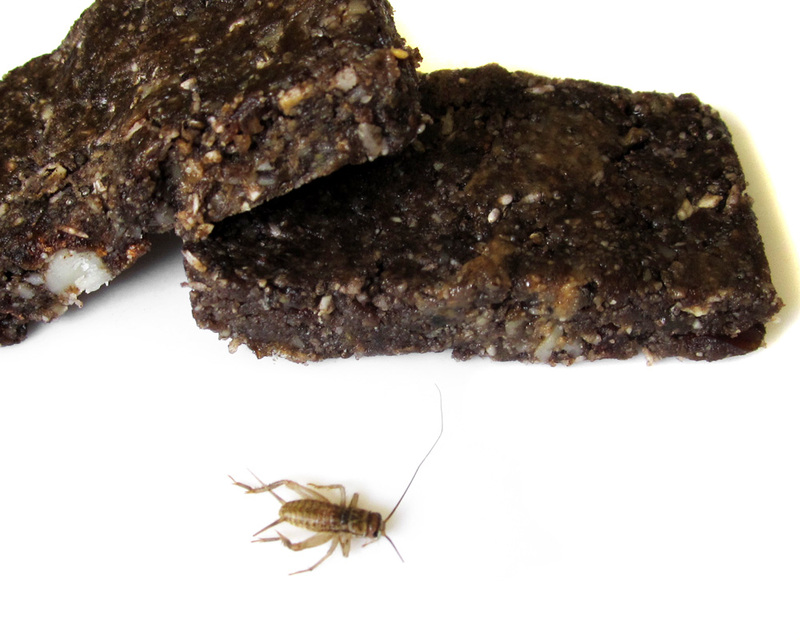 100 crickets (frozen, boiled, baked, ground into cricket flour), dates, cashews, sunflower seeds, chia seeds, almonds, apples, maple syrup, cinnamon. Delicious dessert. Great way to introduce the concept for the very squeamish. Everyone loved these. 50 waxworm caterpillars (toasted on a hot pan, then ground in a food processor), plain hummus. 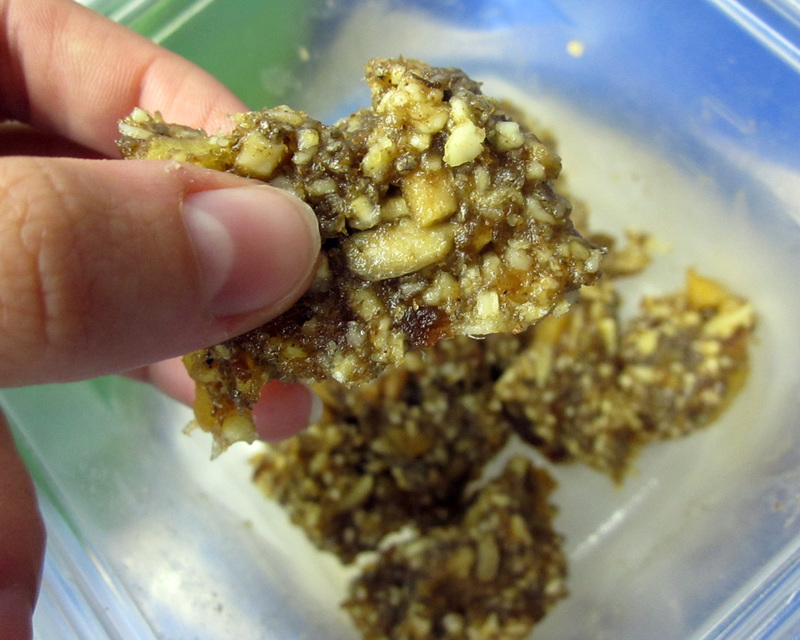 Tasty and nutty. Everyone liked this one too. I think it tasted better than the plain hummus. 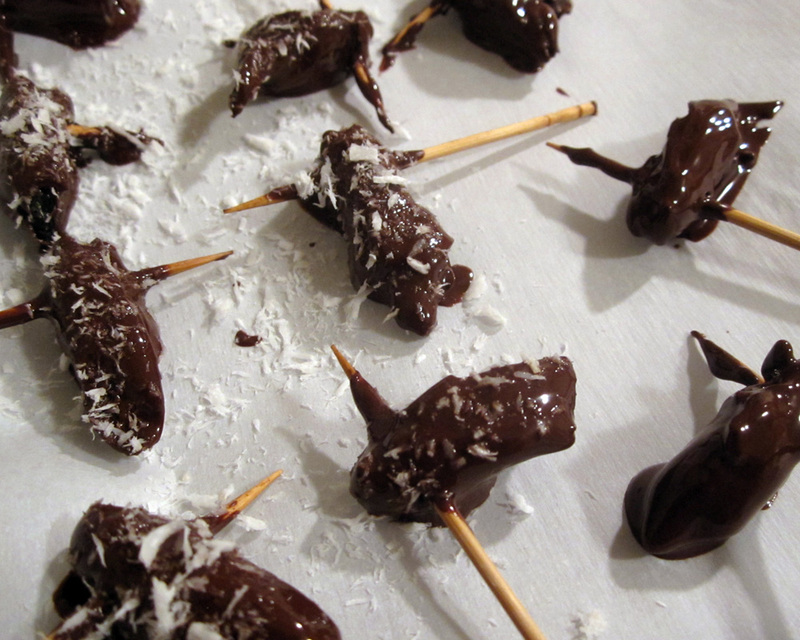 Periodical cicadas wrapped in bacon and baked in the oven, some baked plain and then dipped in chocolate. 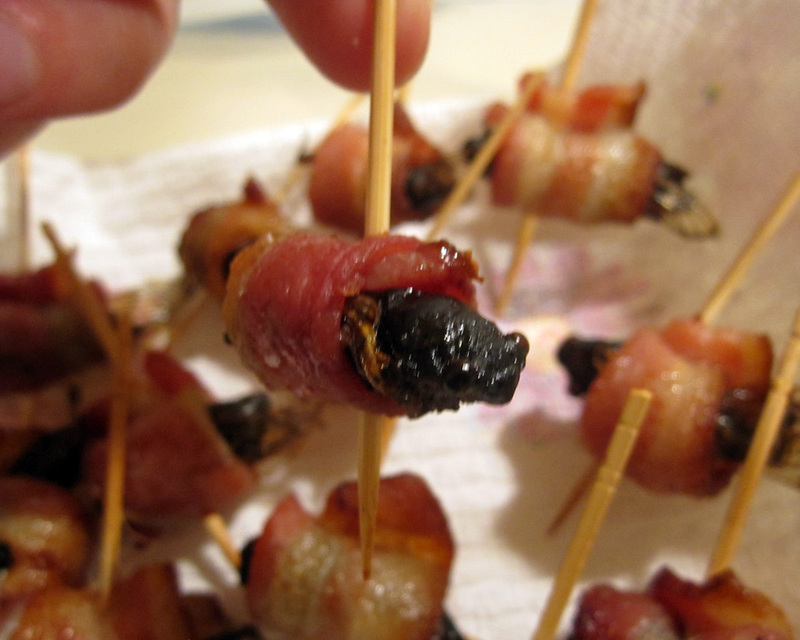 The bacon ones were a yummy combination. The chocolate was so-so. Mexican “chapulines” are grasshoppers cooked in garlic and lime juice. I did that with the katydids. Tasty, could be crunchier though. Good snack. Hit-or-miss with the students, some didn’t like them, some wanted more. 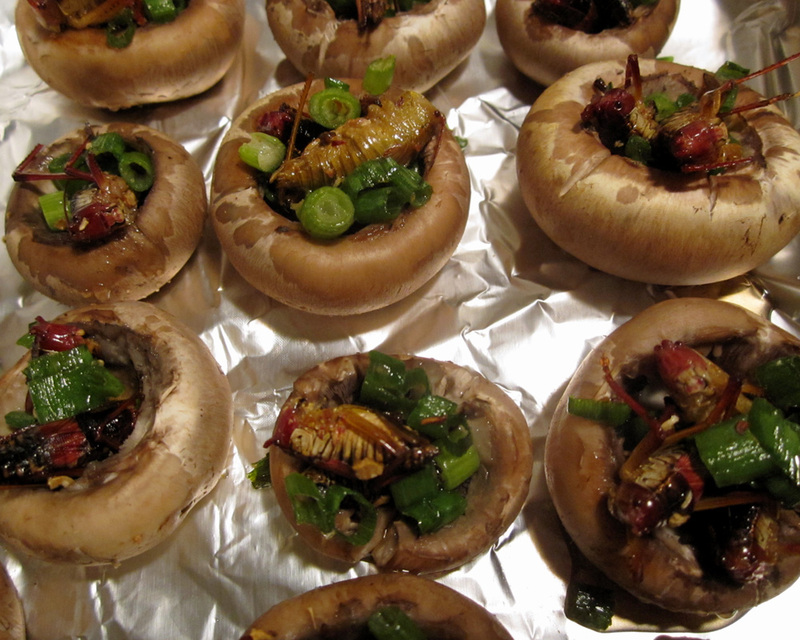 Texas katydids, green onions, coconut oil, Thai seasoning. The toughest to eat, mentally. The big legs got stuck in people’s teeth. The bites were too big and you had to chew for too long. The taste wasn’t bad, but the texture got to a lot of people. 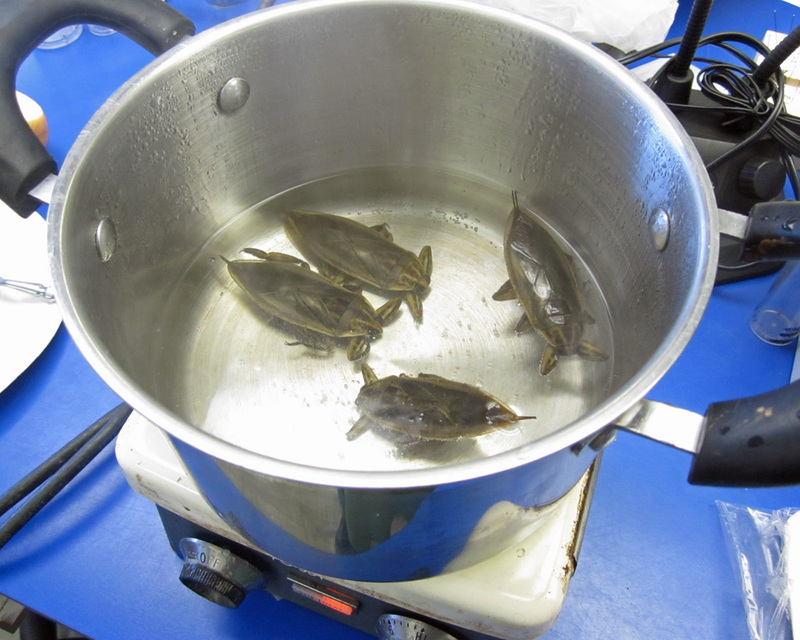 Giant Water Bugs from Thailand, boiled. 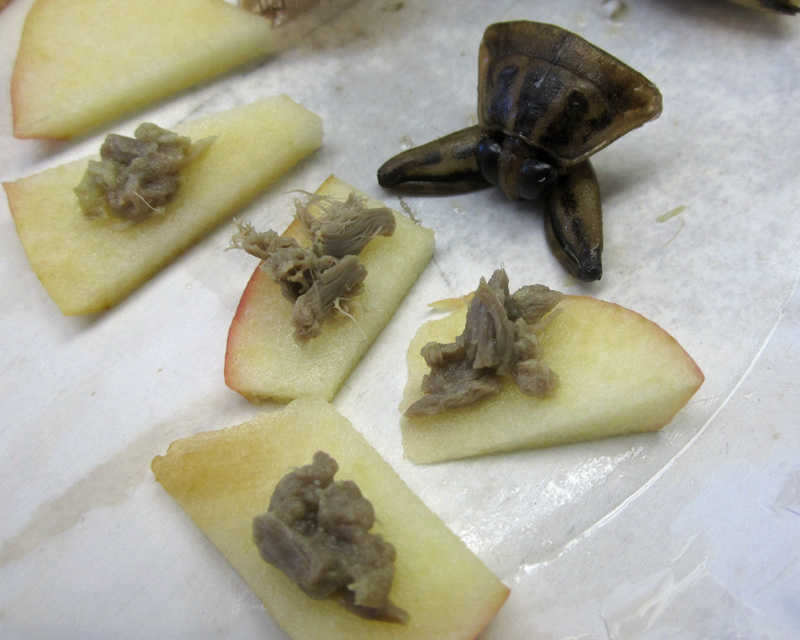 Thoracic meat eaten with apple slices. The most daring dish, cooked right here in the lab. Took some work to get the insects open and scoop out the meat. 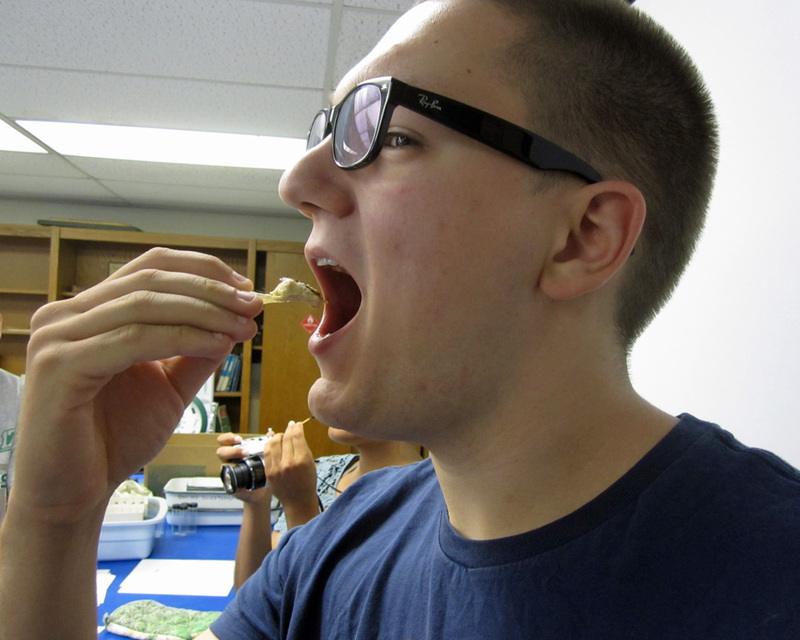 The flavor was very strong – not “I want to spit it out” terrible, but so bizarre none of us knew how to describe it. Buttery, fishy, salty… I can imagine it being tasty in a dish, not so much on its own though. 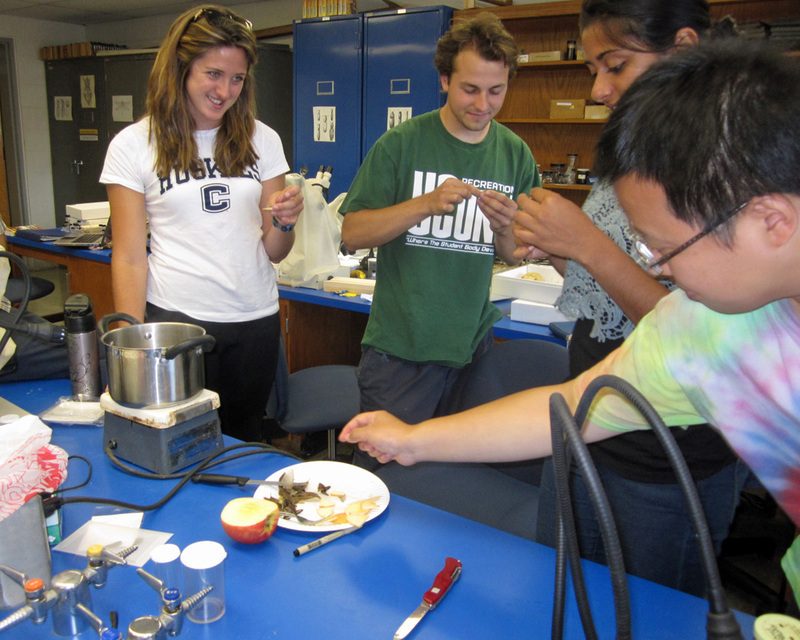 For more photos of the cooking process and student reactions, check out our class Flickr page!